1. Preserving an image on the page where it originally appeared. 2. Cutting the image out of one page and adhering it elsewhere to another page of the book. 3. Adding in new images that weren’t originally included in the book. This page shows all three of these methods. The images on the far left and far right were original to this page. The woman playing the piano (on the right) was cut from another spot in the book and reintroduced here. 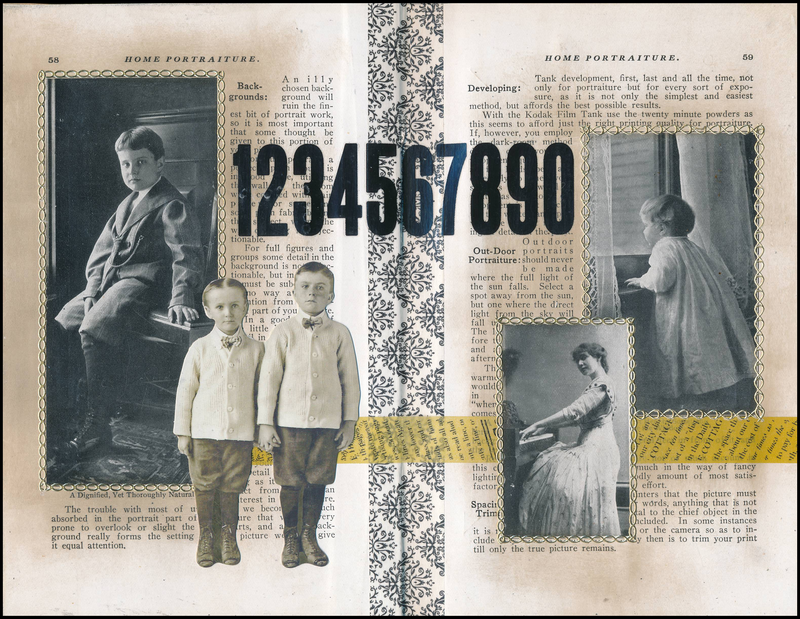 The two boys on the left side were not in the original book but were purchased from the Tim Holtz collection and added in. I applied decorative sticker strips around the images to make them stand out a little more, and used blending tools and Distress ink to darken the page around the images. I used a piece of washi tape to reinforce the spine, and another to go horizontally across the entire spread. The large numbers are rub ons. I like the way some of the book’s original words show around the images, whether they were original to this page, original to the book but from a different page, or added in from an outside source.